A soft cover colorful fiction book that comes with a large tuba toy, 3 character toys that fits inside the Tuba Toy, a bookmark and a code to become a “Tuba Troop” member. THE TOYS: Enhance imagination and creativity by role playing the educational messages. A big Tuba toy that contains a set of soft and colorful character toys of our hero Mitch, Dad and Chair-Mitch. Hey, you can even take them to the Bath! Side A - A step-by-step guide for caring adults. Side B - Fun activities for children. 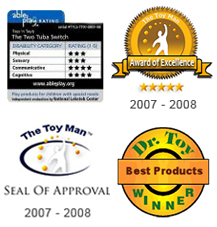 * The Toy Man™ (Seal of Approval, Award of Excellence, and Editors Choice Award). * AblePlay Seal of Approval for children with special needs. THE BOOK: Fun book activities are embedded in this colorful soft cover picture book. Beautifully illustrated by Dave Hill. Children identify with our hero, Mitch, who turns into objects whenever he is shy. Mitch learns about his own abilities after he gets lost as a tuba and befriends his shyness and a girl named Lee. 1. Soft cover story picture book. 2. Tuba toy and a set of character toys - Dad, Mitch & Chair-Mitch. 4. A code to become a ‘‘Tuba troop‘‘ member. This product provides you (parents, therapists, teachers) the means to play and socialize with children and assist them to deal with social challenges in their daily lives, like overcoming shyness in children. This is also a perfect activity for homeschooling. All together fun and a social emotional learning experience as never before!